Former Catholic Archbishop of Brisbane, James Duhig, is no stranger to these pages. 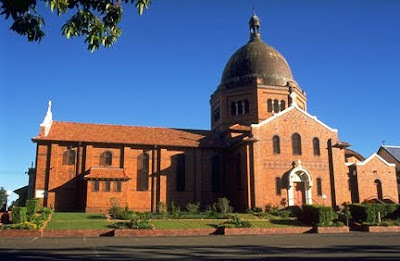 That's because many of the impressive churches that he had built on hilltops around Brisbane are such landmarks. Duhig loved property, and he loved building churches. Here is one that he had constructed at Nundah in 1925-6 - Corpus Christi. Corpus Christi Nundah was constructed by SS Carrick to a design by Hennessy, Hennessy, Keesing & Co for £16,840, and it was officially opened in November 1926. Duhig and the architects had a mutually beneficial relationship, completing many projects together, with Jack Hennessy being a personal friend of the archbishop's. "In Brisbane the Roman Catholic Archbishop, James Duhig, was planning the construction of his Cathedral of the Holy Name, to the design of the Sydney architects Hennessy & Hennessy. Jack Hennessy prevailed upon Duhig to sign a contract with a company, Concrete Constructions Ltd [CCL], which had an interest in Benedict Stone. Duhig had seen the material in the United States in 1926, notably at Soldier Field, and after some initial reluctance he became a convert. Hennessy sent the engineer A S MacDonald to America to investigate the process, and MacDonald came back with a recommendation that Duhig establish a Queensland company to obtain the licence and to make Benedict Stone locally. This was done upon the basis that Duhig or his nominee would provide the capital for the factory, and would pay 5.4 pence per cubic foot in royalties to the parent company. Works were established in Light Street, and were opened by the Governor on 9 August 1929. The American company sent out an engineer, William Jackson Brown of Baltimore, to manage the plant. But by the time the first block of Benedict stone was laid, late in 1929, both Duhig and CCL were under stress, and the ultimate result was that the Cathedral project foundered. Benedict Stone continued to be manufactured in Brisbane, where it was used for the Shell Building, and the Tattersall’s Club extension of 1939. Australia-wide it was used especially in the various offices of the Colonial Mutual Life Assurance Co designed by Hennessy & Co. "
Both Corpus Christi and the plans for the proposed cathedral included a dome, which was thought to be a homage to St Peter's in Rome. That is why he was known as 'James the Builder' (long before Bob came along! Lol!) He certainly left a legacy within the brisbane catholic community. And I have to agree...the dome is quite reminiscent of st peters basilica!